The first annual Global Multi-stakeholder SIDS Partnership Dialogue was held on 22 September 2016 during the 71st session of the General Assembly as a High-level Breakfast Event, focusing on the launch of new partnerships devoted to SIDS, and the announcement of new commitments from existing SIDS partnerships. The Dialogue is an integral of the SIDS Partnership Framework which was launched by the General Assembly in 2016 as a follow-up to the SIDS Conference, held in Samoa in 2014. The Framework is one of a kind at the United Nations in following up and monitoring progress of voluntary commitments from multi-stakeholder partnerships aimed at driving sustainable development in Small Island Developing States. The event was hosted by H.E. Dr. Mohamed Asim, Minister of Foreign Affairs of Maldives and H.E. Mr. Vincenzo Amendola, Undersecretary of State for Foreign Affairs, Italy, represented by H.E. Mr. Sebastiano Cardi, Permanent Representative of Italy, in collaboration with UN DESA and UN-OHRLLS, and was attended by over 100 participants from governments, UN entities, civil society representatives, and focal points of SIDS partnerships from all regions of SIDS. 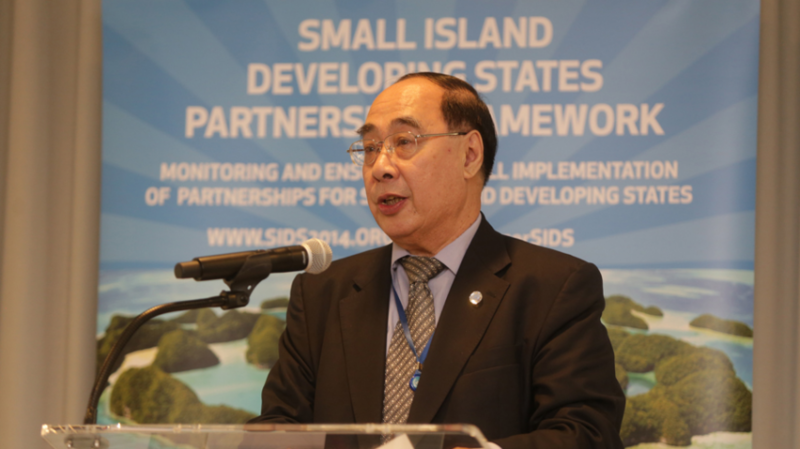 On the occasion of the event, Mr. Wu Hongbo, UN DESA’s Under-Secretary-General for Economic and Social Affairs, launched a publication on Partnerships for SIDS, which was the result of a review of 40 partnerships devoted to the sustainable development in SIDS. Mr. Wu noted that the follow-up of the SAMOA Pathway is also an integral part of the High-level Political Forum, which is the central platform for the follow-up and review of the 2030 Agenda for Sustainable Development. Mr. Gyan Chandra Acharya, Under-Secretary-General and High Representative for the Least Developed Countries, Landlocked Developing Countries and Small Island Developing States (OHRLLS), moderated the interactive dialogue of the meeting, which included the launch of several SIDS partnerships and commitments. H.E. Mr. Hiroshi Minami, Ambassador, Deputy Permanent Representative of Japan to the United Nations, announced a new partnership between Japan and the Secretariat of the Pacific Regional Environment Programme (SPREP), focusing on addressing climate change and environmental issues in the Pacific region. H.E. Mr. Frederick Mitchell, Minister of Foreign Affairs and Immigration, Bahamas, represented by H.E. Ms. Tishka Francis, Deputy Permanent Representative, Permanent Mission of the Bahamas, announced the organization of the Bahamas Symposium on “Implementing the 2030 Sustainable Development Agenda in Small Island Developing States (SIDS): equipping public institutions and mobilizing partnerships”, which will be held in Bahamas in February 2017. Ms. Meg Taylor, Pacific Islands Forum Secretariat announced a mapping which the Pacific Islands Forum Secretariat had conducted of all the 300+ partnerships that were launched at the SIDS Conference in 2014. Out of all partnerships, the Pacific Islands Forum Secretariat will focus on monitoring a total of 74 partnerships; ensuring commitments of those partnerships are well integrated into the Pacific SDGs Roadmap, National Development Plans and the Framework for Pacific Regionalism. Mr. Paul Holthus, Founding President and CEO, World Ocean Council announced (submitted in writing) the launch of the Global Young Ocean Leaders program, which aim is to help ensure the next generation of business leaders understand the need and value to address sustainable development for the ocean and islands, as well the organization of the Sustainable Ocean Summit (SOS), as an annual global, multi-industry gathering developed by, and for, the business community focused on sustainable development for islands and the ocean. H.E. Dirk Achten, Secretary General of the Ministry of Foreign Affairs, Belgium announced the organization of an Expert Group Meeting which will take at the UNESCO Liaison Office in Brussels in 2017, focusing on legally binding treaties on protection of biodiversity beyond national jurisdictions. Mr. Arno Boersma, manager of the Centre of Excellence for Sustainable Development of SIDS – an initiative of UNDP and the Government of Aruba – announced that they will be organizing its inaugural training in November, 2016 in Aruba. Representatives from all SIDS have been invited to attend. The training will focus on developing roadmaps for sustainable development, most notably for renewable energy, sustainable tourism and PPPs. Mr. Gyan Chandra Acharya then closed the high level event.